Now let's talk about cake - one of my favourite topics in the whole world - and I have a good one for you today. 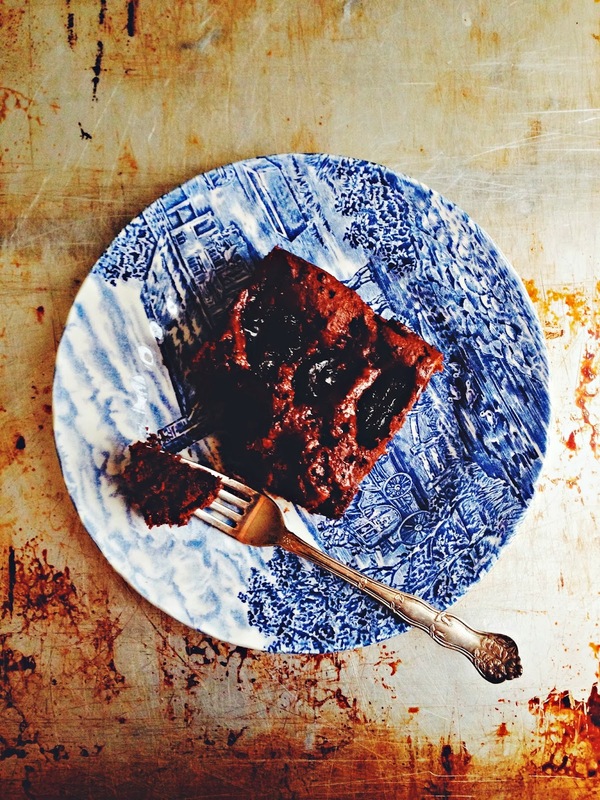 When one thinks of cake, one doesn't often associate it with prunes, am I right? These über-healthy dried plums are more known for their benefits to your digestion than they are for adding drama to baked goods, but I'm here to rectify that. Also, you can eat cake and feel like it's practically health food - bonus points all over the place. But rest assured that the cake will not taste like it's health food, catch my drift? 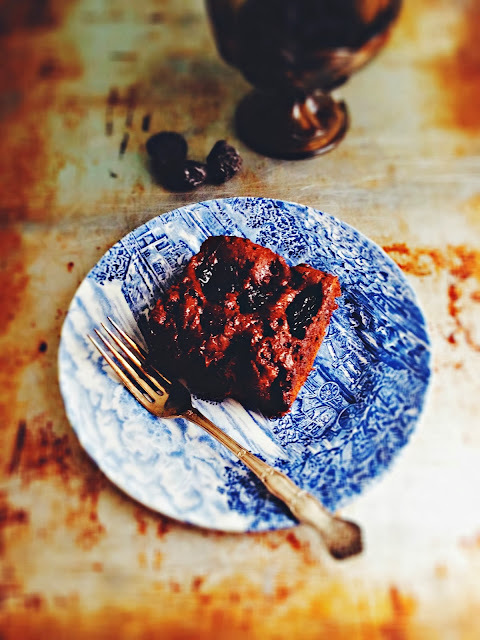 Prunes plump up in warm brandy and get plunked deep in a batter that is reminiscent of gingerbread. Secret: there are prunes puréed in the batter, too. But don't worry, the tasty chunks of dark chocolate mask their cover very well. And then of course there is the boozy, sticky glaze poured over the cake whilst it's still warm - rendering it utterly moist and hopelessly addictive. Even on the fourth day it still held these qualities. I blame it on the prunes. While not the most photogenic of cakes, what it lacks in appearance it makes up for in taste. Served while warm, with perhaps a little softly whipped cream on the side, this cake could indeed bring sweet tidings to all. A couple of notes: first off, I want to say that my foot is back to normal. Seven weeks post incident and I can walk and walk quickly (I'm not a runner, but I suppose I could if I had to), even in boots with heels! This is very happy news, and to celebrate I think it's only appropriate that I go shoe shopping. Agreed? Preheat oven to 325*F. Butter an 8x8 inch square baking dish and line the bottom and sides with parchment paper so it hangs over the edges. Heat 1/2 cup prunes with 1/3 cup brandy in small saucepan over medium heat until warm, about 4 minutes. Watch it doesn't catch on fire! Remove from heat. Sift flour, cocoa, baking powder, baking soda and salt in medium bowl. In the bowl of a food processor, blitz the remaining 3/4 cup prunes with buttermilk and oil until light and shiny paste, about 3 - 4 minutes, stopping to scrape down sides of bowl. Scrape into large bowl and whisk in egg, sugars, molasses. Fold in the flour mixture until no streaks remain. Stir in chopped chocolate. Scrape into baking dish and smooth top. Cut each soaked prune in half and press pieces just so they are below surface of cake. Reserve remaining prune/booze liquid. Bake until toothpick comes out clean, about 45-50 minutes. While cake bakes, combine water with sugar in small saucepan over medium heat. Stir until sugar dissolves, just a few minutes. Remove from heat, let cool 10 minutes then stir in 2 tbsp of brandy and remaining prune soaking liquid. When cake is done, remove from oven, poke several holes in cake and pour boozy syrup evenly over cake. Let cool completely on rack, at least one hour, then serve. Makes 6 - 8 servings. Adapted from Yotam Ottolenghi and Chatelaine November 2013. This cake look amazing....can't wait to try! First of all a well deserved award Renee. As for the cake it makes dessert simple and delicious so no emotional meltdowns with unexpected incidents. Believe it or not, I don't believe I've ever eaten a prune. How is that possible?! Must change that and try some boozy prunes :) And totally agree ... it isn't Christmas until I site down to watch Love Actually. 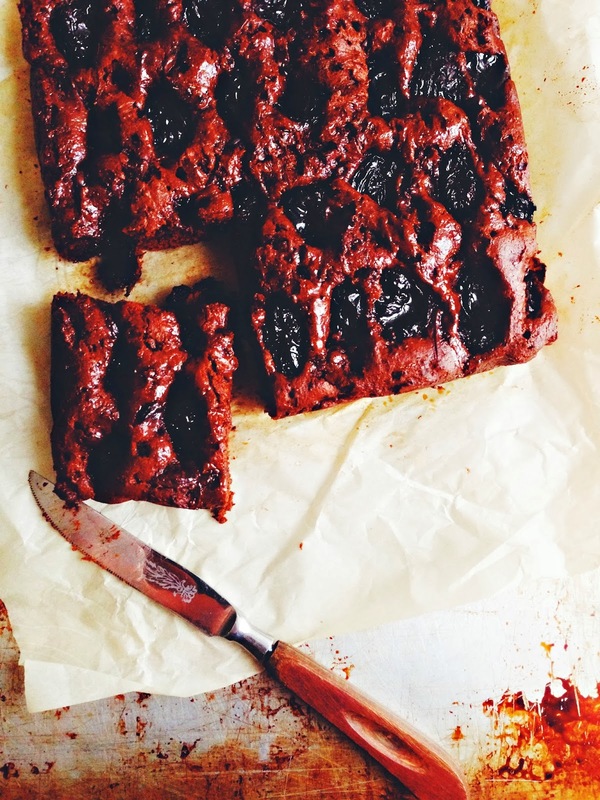 This cake looks so lovely - chocolate and prunes are a surprisingly good combination, and with all of that other goodness mixed in, this could totally pass as a healthy(ish) breakfast. Right? Wonderful combination, chocolate and prunes! And I agree with you, where did 2013 go? Congratulations on the award too, your blog is wonderful! I'm trying this with some lovely tunisian dates, because that's what I have on hand. I KNOW it'll be amazing! Thanks! Liz - Thank you! Let me know how it turns out! Val - I hope so! 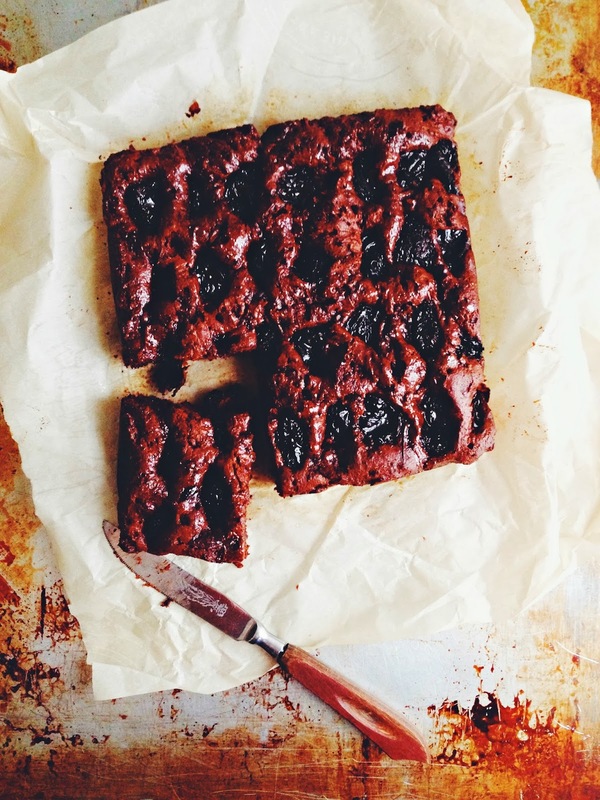 Jennifer - I'm a latecomer to the prune as well, but now they're always in my cupboard. Must be getting old! Agi - Thanks so much! And yes, chocolate/prune go so well together. And extra points for iron and fibre! Anon - Good call! Let me know how it turns out with the dates! It was very good - the dates worked well. Only I was a little generous with the brandy, so those who loved it, LOVED it, and a few were really put off... haha!